Paradise on Earth is never too far, you just have to know where to look for it. Italy is full of hidden gems that bewitch visitors, and today we would like to focus on little known, Eden-like islands. 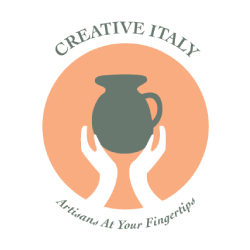 While most people have heard of or seen the beauty of Sicily, Sardinia, Capri and Ischia, less travelers are familiar with places such as Filicudi, Ventotene, and Giannutri, let alone their history and unique local characteristics. Join us in our hunt for secluded, amazing islands in the Mediterranean Sea! The exotic island of Filicudi was rediscovered in the 1970s by artists such as designer Ettore Sottsas, novelist Roland Zoss, photographer Serge Libiszewsky, and editor Giulio Einaudi. Despite a small area of 9.5 km2 (3.7 sq mi), its land produces wine, olive oil, grain, and vegetables. Three quarters of the island belong to a Nature Reserve. 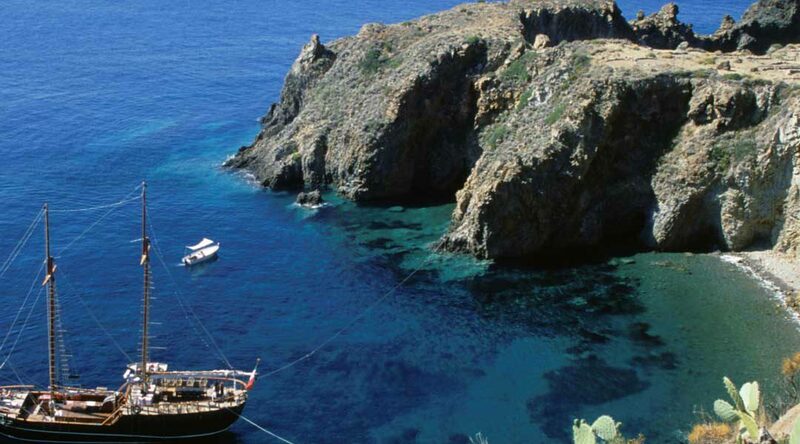 The volcanic finger-like rock of La Canna is the symbol of Filicudi, which also features the remains of a Bronze Age village at Capo Graziano. Filicudi is part of the volcanic archipelago of the Aeolian Islands, located north of Sicily and named after the demigod of the winds, Aeolus. It comprises seven other islands: Lipari, Vulcano, Salina, Stromboli, Alicudi, Panarea and Basiluzzo. Filicudi is the wildest island of the bunch. Another pristine and unique place is Stromboli, which contains one of the three active volcanoes in Italy. The island was the setting of the final chapter in Journey to the Center of the Earth (1864) by Jules Verne, and inspired author J.R.R. Tolkien for his fictional volcano (Mount Doom) in Mordor. Stromboli’s volcano is constantly active with minor eruptions, often visible from many points on the island. In particular, you can enjoy the amazing show and breathtaking starred sky at night, when the street lights stay switched off on purpose. How exciting would it be to explore the island that was the setting and inspiration for Alexandre Dumas’ novel, The Count of Monte Cristo? Montecristo has an area of 10.39 km2 (4.01 sq mi) and its history begins with the Iron Age. Nowadays it is a state nature reserve and has only two permanent human inhabitants, both reserve keepers. The conditions that restricted the establishment of human settlements on Montecristo have favored the preservation of its flora and fauna. Animals and plants once found throughout the Mediterranean still live on the island. In particular, it hosts the only population of Italian wild goats, and endemic subspecies of lizards and large colonies of seabirds thrive on it. Montecristo is part of the Tuscan Archipelago National Park, which includes six other islands: Elba, Giglio, Capraia, Gorgona, Giannutri and Pianosa. The entire area is simply mesmerizing, with a beautiful sea environment that is heaven for divers, who find seagrass meadows, anemones, sea fans, corals and moonfishes, among other species. It’s very hard to recommend some islands instead of others, since they are all so beautiful and diverse. However, another that deserves a special highlight for its historic treasures is Giannutri, which was mentioned by Pliny the Elder in his Naturalis Historiae and by the Latin geographer Pomporio Mela in his Dechorographia. Giannutri is the smallest island of the Tuscan archipelago (2.6 km2), yet it houses one of the most prestigious maritime villas from Roman times: Villa Domizia. It was built in the period between the I and the II century AD, and the ancient ruins hint at its complex architecture. This is a place where you can unleash your imagination, as you visit the ninfeo (a cave with a fountain to celebrate the cult of the nymphs), the rectangular courtyard, the bedrooms and panoramic terrace, as well as the ergastulum, or servants’ housing quarters. The Pontine Archipelago is located off the coast of Gaeta, at the border between Lazio and Campania. 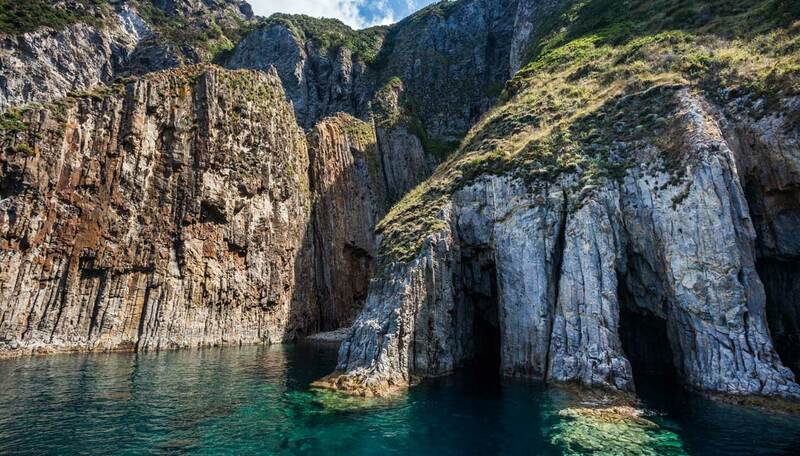 It is named after the largest island, Ponza, and also includes Palmarola, Zannone, Gavi, Ventotene and Santo Stefano. Ventotene, which was known as Pandataria during Roman times, became famous because it was the island where the emperors Augustus, Tiberius and Nero exiled some of their daughters, nieces and wives for different reasons between 2 BC and 62 AD. 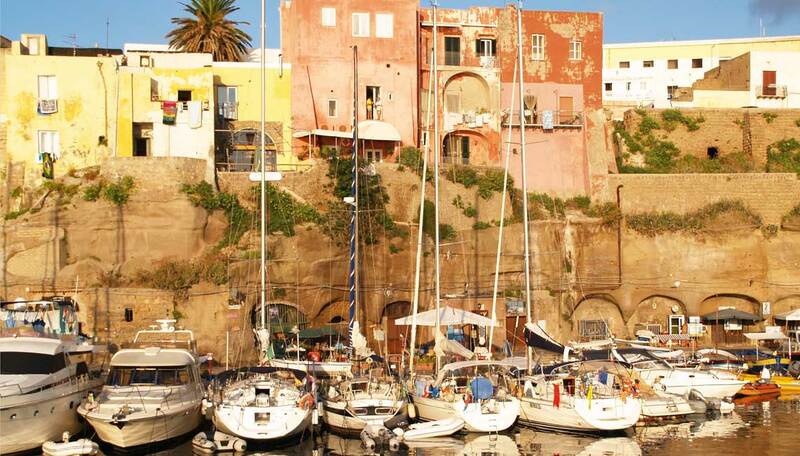 Although it is reached by regular scheduled ferries, Ventotene has a remote feel and a real island character. The first thing to strike you as you arrive by sea, is the red-brown tufa wall that characterizes the entire perimeter of the island. Here, the ingenious Romans put their engineering skills to the test 2,000 years ago, when they excavated some 60,000 cubic meters (2,118,880 cubic ft.) of tufa and created the Roman Port as well as an extensive rainwater catchment system of channels and cisterns (the island has no natural springs of fresh water). How do the modern-day local fishermen use the heritage left by their Roman ancestors? A friendly chat with them will introduce you to fascinating stories connecting the past, the present and the future! If you love solitude and living in wild nature, Palmarola Island is the most charming place you can find. It features a perfectly transparent sea and an extremely craggy coast dotted with grottos, bays and cliffs. Here you will find the “fucili”, or leftovers of a collapsed natural arc; the impressive cliffs known as “cattedrali”; and a small chapel on top of San Silverio Rock, dedicated to the local patron. There are no specific tourist facilities, but only two typical restaurants that open in summer. It is a truly lost, wild treasure isle! Spring is just around the corner, and summer will be here in the blink of an eye. These are the perfect seasons when you can enjoy an exclusive, relaxing retreat in Italy’s jewel islands. Make your experience truly different and authentic, by going beyond what you see on a postcard: engage with the local people, learn about their heritage, explore the ancient history and hidden nature treasures. Contact Italian Special Occasions DMC for bespoke experiences tailored to your dreams and needs.